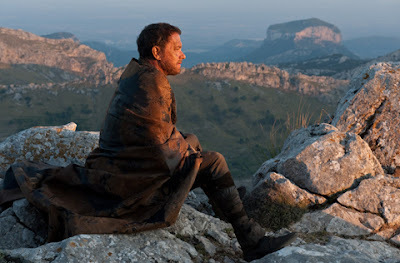 ATLAS SHRUGGED: a review of "Cloud Atlas"
"12 souls from now U and me will still be here"
If I could rate and review movies solely based upon sheer ambition, then "Cloud Atlas" would be the best film of 2012 by a long shot. Unfortunately, I cannot rate and review films based solely upon sheer ambition, no matter how high the filmmakers have creatively set the bar for themselves. Ever since the conception of Savage Cinema, I have often lamented about the pathetic lack of cinematic risks taken in our 21st century motion pictures. Certainly some films and specific filmmakers who have achieved creative autonomy combined with box office clout are able to get films that are completely unlike the bulk of what is typically released. However, and sadly, those days when studios seemed to nurture and even champion filmmakers as artists feel to have long abandoned us all. So when a truly risk taking film does indeed arrive, I often find something to truly celebrate as I have seen so many films throughout my life and I am aware to the point of fatigue with all manner of contrived and cliched film storytelling conventions, that I am always on the lookout for something truly special. With the arrival of "Cloud Atlas," the first filmmaking collaboration between The Wachowskis and Tom Tykwer, it seemed as if something special was definitely ready to grace us all. I deeply appreciated the level of risk and ambition it unquestionably took to try and adapt a novel that most felt to be unfilmable. But, we do have The Wachowskis who between the years of 1999-2003 gave us the game changing science fiction/philosophical/martial arts fueled "The Matrix Trilogy" plus the politically charged comic book thriller they wrote and produced, "V For Vendetta" (2006) and the unfairly maligned psychedelic family film adaptation of "Speed Racer" (2008). Tom Tykwer is best known for his outstanding, ferociously paced existential race against time "Run Lola Run" (1998), truly one of my favorite films from the 1990s. With these filmmakers, we have been given their unique blending of genre stylistics and cosmic musings that perhaps working on a project like "Cloud Atlas" would play to their strengths handsomely. Well...yes and no and I will elaborate in full very shortly. But, I will first announce to you that I did not feel necessarily disappointed with "Cloud Atlas" and I do not think that it was a bad film by any means. In fact, I do think this is a film I would easily see again in the future. But, as for all of you, dear readers, I think purchasing a ticket to this cinematic odyssey would depend upon your individual tastes, patience and willingness to try something that it defiantly not able to describe in one digestible sentence. And truth be told, "Cloud Atlas" is not even an instantly digestible film as there is so much to chomp upon. That said, the end result and my emotional reaction to it was surprisingly muted and underwhelmed when I am most certain that The Wachowskis and Tykwer desired to blow my cinematic mind to the furthest reaches of the cosmos and back. 1. The Pacific Ocean 1849-Where we are immersed in the socially conscious evolution of a naive notary (Jim Sturgess), his friendship with a slave (David Gayasi) and battles with a duplicitous doctor (Tom Hanks). 2. Cambridge 1936-Where Robert Frobisher (Ben Whishaw), a penniless musician, is hired by the famous, elderly composer Viyvyan Ayrs (Jim Broadbent) to work as his transcriber and the powerfully emotional and creative relationship the twosome forge. 3. California 1973-Where we meet intrepid journalist Luisa Rey (Halle Berry) as she begins to uncover a lethal mystery. 5. Neo Seoul 2144-Set within a totalitarian society, we meet Sonmi-451 (an effectively haunting Bae Doona), a clone being interviewed before her execution due to her seismic role within a rebellion. 6. The post apocalyptic Earth, 108 Winters After The Fall-After and unknown cataclysm, society has returned to primitive life as we encounter tribesman Zachry (Tom Hanks) and view his fight for survival against violent tribes as well as his budding relationship with Meronym (Halle Berry), a representative of an outside and more technologically advanced sector of the planet. Throughout all six stories, we see how certain patterns of human existence are repeated, challenged, upheld, broken, paralleled and divided. We also are asked to regard how these characters and stories, and furthermore, all of human existence itself, are all linked together through our behaviors and how the seemingly disparate objects like lost letters, recorded music, film adaptations and previously hidden manuscripts serve as conduits to bind us together. "Cloud Atlas" is a kaleidoscopic mosaic of the human condition which contains many of the concepts and themes that I have cherished quite often on this site. The wonders of inter-connectivity and just adhering to an overall uplift of humanity are themes to cherish in the movies and I deeply applaud the Wachowskis and Tykwer for joining forces to create a film that is not a cynical exercise and is actually quite earnest in the hopeful messages they are attempting to convey. Additionally, "Cloud Atlas" is a visually dynamic experience. It is a veritable feast for the eyes presented with the stunning cinematography we have come to expect from these filmmakers plus a gorgeous attention to period detail for all of the film's eras, which makes "Cloud Atlas" always feel authentic while also existing as if inside of a dream. The structure of the film is always coherent and cohesive. I never felt lost in the shuffle of stories for a moment and I also have to say that for a film that has a running time of a hair under three hours, "Cloud Atlas" flows smoothly and rapidly. Throughout the film, as I would think you may have been able to gather from the film's description, several of the film's actors take on several roles regardless of age, race and gender as well. With this tactic, the Wachowskis and Tykwer have worked diligently and have also taken a tremendous risk by illustrating and emphasizing the soulfulness of the work rather than the standard storytelling job of focusing on characters to get their existential points made. What we are witnessing are situations and behaviors which we can easily place ourselves into for the myriad of souls that populate "Cloud Atlas" represent everyone watching the film as well as the characters within each individual story. Again, I greatly appreciate these filmmakers for desiring to take on the GIANT SIZED themes so passionately. Now, the closest film comparison I would gather anyone would make with this film would have to be Writer/Director Terrence Malick's "The Tree Of Life" from last year. Yet, where that film was indeed an art film with a capital "A," "R" and "T," which did leave audience members frustrated due to it's somewhat impenetrable framework, "Cloud Atlas" attempts to take on the exact same concepts but with a more accessible and populist approach. (Hey, when you have flying cars and laser gun battles, you can't leave the fanboys out of the mix even when you are exploring the meaning of life.) But, this approach did present a major problem for me as I watched "Cloud Atlas," and that was simply the following: Where "The Tree Of Life," while extremely esoteric, spoke to my soul and gave me an experience that was essentially primal, "Cloud Atlas" picked up the BIG bat and took a MIGHTY swing at the grandest concepts of all but it was somehow a surprisingly shallow experience that never spoke to my soul and only offered nothing more than greeting card platitudes. Oddly enough, and in addition to "The Tree Of Life," what I thought about the very most during "Cloud Atlas" was the television series "Lost"! Now, that was an extraordinary way to have something populist and genre specific to science fiction, action dramas and even some pulpy romance and also explore themes of good, evil, heroes, villains, morality, faith, reason, loyalty, community, inter-connectivity, crime, punishment, and redemption through characters we witness in the past, present, future and even through alternate realities and quite possibly the after-life. That show, while it entertained me tremendously, also shook my soul to its core bringing me directly in touch with those exact primal emotions I felt while viewing "The Tree Of Life." I mention "Lost" to show that merging high concepts with accessible storytelling can be done successfully and I just didn't think that the Wachowskis and Tykwer accomplished this feat nearly as well as they had hoped. On the one hand, I am not quite certain what went wrong and I do feel that, again, the film's trailer may have had something to do with my underwhelmed response. "Cloud Atlas" the motion picture was indeed preceded by "Cloud Atlas" the six minute trailer, which I viewed three times in a row when it premiered on-line. I just sat open mouthed, with chills running up and down my spine, completely confused with what I was watching but undeniably in awe. That sense of awe never arrived at any point during the entire opus of "Cloud Atlas" the motion picture and I could not help but to wonder if the people who made the trailer somehow made a better movie than the finished film itself! Aside from the battle between coming attraction trailers and the completed works, there is the problem that not all six storylines are equally compelling. I'd say about half of the stories felt to be wondrous enough that they could have existed as full length features of their own. My personal favorites were the tales set in 1936 Cambridge (which explored inspiration, creativity, and a truly heartfelt and romantic homosexual subplot) and the story set in present day London was so unpredictable that I was just carried away with its audacity. The high point of "Cloud Atlas" for me, was certainly the story of the clone rebellion in 2144 at that film explored the classic science fiction issue of non-humans gaining humanity and the dark turmoil their lives become. Here, the Wachowskis and Tykwer worked at their very best giving me a story that reminded me often of Ridley Scott's "Blade Runner" (1982) and even this summer's "Prometheus" as well as Steven Spielberg's incredible and deeply disturbing "A.I. : Artificial Intelligence" (2001). On the other hand, we have the story set in 1973, featuring Halle Berry's journalist character pursuing some major story while evading certain death time and again and it all felt to function as nothing more serious or interesting than a tired old Nancy Drew novel. Even worse, we have the post-apocalyptic tale in the far future. For that segment especially, I had the feeling that perhaps it was something that worked better on the page in the novel rather than something to be visualized and acted out. Those stories, plus more than a few moments contained here and there throughout, felt to be quite silly, thus robbing "Cloud Atlas" of its full cumulative power. And then there was another and crucial element of "Cloud Atlas" that was not nearly as successful as I would gather the Wachowskis and Tykwer had hoped would be. Since Tom Hanks, Halle Berry, Jim Broadbent and others are each portraying up to five or six different roles each throughout "Cloud Atlas," we have to witness the limitations of make up artistry and I have to say that the plethora of funny wigs, nose and teeth prosthetics and other accouterments were quite distracting and at times ridiculous (Hanks as a cockney voiced gangster was not one of the film's high points) to the point where they kept taking me out of the experience the Wachowskis and Tykwer were obviously working so furiously to deliver rapturously. Where I was indeed swept away by the variety of performances given by Broadbent, and especially Hugo Weaving as the film's purely malevolent force regardless of storyline and time period (although Weaving in drag as an evil nurse was a big mistake), only Hugh Grant seemed to transcend the cosmetics and lose himself in whomever he was portraying. Grant was indeed consistently unrecognizable. Flaws and all, I knew throughout "Cloud Atlas" that the Wachowskis and Tykwer were not resting on their creative laurels one bit and they obviously poured every bit of themselves into every single frame of this lush and luxuriously mounted motion picture. I loved the risk, the boldness, the brazenness, the heft and the level of ambition was near inspirational as well as a reminder to all filmmakers that when you have the means and opportunity to make a movie, then grab it with both hands tightly and go for it for a gift like this is not ever meant to be wasted. This is precisely the type of talent and commitment that should be celebrated by anyone who loves the movies. But even so, I wished that I was as swept away with the final result. Now that would have really been something to celebrate. 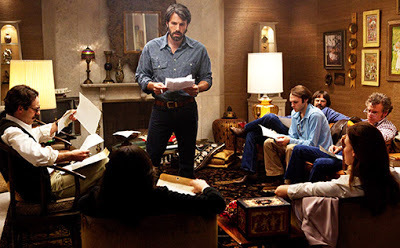 THE BEST BAD IDEA: a review of "Argo"
The cinematic resurrection of Ben Affleck continues to greatly ascend! Perhaps it is due to his relative closeness to my own age, but I have felt a certain kinship, or at least a relatable quality towards Ben Affleck. Nothing bizarre, mind you. But, I suppose it is somewhat akin to how I felt (and still feel) towards the youthful actors that were so prevalent during my own teen years, the ones who were also close in age and who were saddled with the horrible pejorative "The Brat Pack." In some ways, those actors (and even some current musicians that are also close in age to myself), sort of felt like the auxiliary members of my own high school graduating class and as they continue onwards within their own lives, I wish nothing for them but to continue to do well and live well. When the moments of public appreciation run high for those people, I somehow feel myself fill with a sense of pride, as if one of our own has made it upon the world's stage, representing my specific generation grandly. For instance, I felt that sensation when Trent Reznor won his Oscar award for his film score to David Fincher's "The Social Network" (2010). I felt it when I first saw Robert Downey Jr. in Jon Favreau's "Iron Man" (2010), looking so dashingly handsome, healthy and almost reborn after his lengthy substance abuse troubles and public controversies. And I also felt that same sensation when I saw Affleck's superb directorial debut, "Gone Baby Gone" (2007), a film so intensely and undeniably riveting that it not only pinned me to my seat for its entire duration, the experience felt as if Affleck himself walked up to me and slapped me in the face for ever doubting his abilities. How foolish of me to not ever realize that after his public cinematic near disintegration, that Ben Affleck had been quietly plotting his second act. With "Gone Baby Gone" and his second feature, the excellent Boston set crime thriller "The Town" (2010), Ben Affleck has revealed a previously unknown and ferocious talent behind the camera. If he at all felt or feels trepidacious with his directorial skills, any internal fears are all unnoticeable as Affleck has elicited a supreme confidence in presenting psychologically complex stories and characters merged with the types of action sequences we would usually see from the likes of cinematic veterans like Michael Mann. Now, Ben Affleck brings us "Argo," his third and most ambitious film yet, which does nothing less than solidify him as one of our strongest new American directors. With "Argo," Affleck has shown the ability to shoulder massively scaled action sequences, masterfully displayed levels of suspense, and expert period details set alongside impressive thoughtfulness, probing questions about our political process and an adherence to the human condition all the while allowing the film to have strong dollops of well placed humor. This is easily an exceptional film that you do not want to miss. Set at the dawn of what would become the 444 day Iran hostage crisis, "Argo" opens with crackling tension as the tumultuous events surrounding the U.S. embassy in Tehran on November 4, 1979 are depicted. Iranian militants, in retaliation for the United States' support for the recently deposed Shah of Iran, storm the grounds and capture the majority of the American embassy staff members, holding them all as hostages. Unbeknownst to the militants, six embassy staff members escape and find refuge in the home of the Canadian Ambassador Ken Taylor (played by Victor Garber) and his wife. While the staff's escape is being kept secret, CIA specialist Tony Mendez (Ben Affleck) is brought in to aid the State Department's mission to extricate the six staff members and return them all to the United States. After discarding several "out of the box" escape plots, (one of which featured the idea of having Americans pose as travelling bicyclists) inspiration finally strikes Mendez after watching scenes from "Battle For The Planet Of The Apes" on television. Create a cover story that a film studio, looking to cash in on the post "Star Wars" gold mine of science fiction films, wants to scout locations in Iran for an upcoming space opera and then, smuggle the six embassy staff members out of the country by having them pose as members of the fictional film's crew. As Mendez's colleagues grudgingly refer to this potential escapade as "the best bad idea" they have heard thus far, Mendez and his supervisor Jack O'Donnell (a solid Bryan Cranston) are then given the go-ahead to proceed. The men then reach out to veteran Hollywood makeup wizard John Chambers (John Goodman) and aging film producer Lester Siegel (a scene stealing Alan Arkin) for assistance to ensure the realism of their cover story, the fictional film now named "Argo." By the time Mendez's plot has been officially hatched, the Iranian militants have arrived closer to discovering not only that six Americans have escaped but also their full identities, making the rescue mission increasingly building into a potential suicide mission. "Argo" is a superbly mounted, multifaceted experience which Ben Affleck beautifully handles like a champion. Affleck skillfully mounts a three act structure of conflict establishment, rescue plot set up and climactic payoff, which then transcends any formulaic tendencies and emerges as a crisply executed hybrid of a caper picture, Hollywood satire and political thriller all seamlessly rolled into one. While "Argo" stands firmly tall on its own cinematic feet, I was, however, very happily reminded of films like Steven Soderbergh's "Ocean's 11" (2001), Barry Levinson's absolutely brilliant political/Hollywood satire "Wag The Dog" (1997), and Steven Spielberg's brutal political thriller "Munich" (2005). Yet, what Affleck achieves wonderfully is how "Argo" perfectly emulates the political thrillers of the 1970s in such exquisite style, cinematography and tone, all the way to the vintage studio logo which opens the film. Now I would gather that for those of you reading this review, you may be wondering why after all of this praise, why did I not award Ben Affleck's "Argo" four stars, just as I have done for surprisingly many films this year. The answer is very simple and please note, my reasoning is not for any faults of the film itself and solely lies within my reaction to it. I just have to say that I think that the film's trailer may have prepared me for an experience which is decidedly different than the one the film actually is. i think I was expecting a film that was more propulsive. One that was more visceral. One that was more explosive. And, dear readers, despite the sheer intensity Affleck builds throughout "Argo," the film as a whole is not that experience at all as Affleck has not quite grown to the level of someone like Christopher Nolan, who has raised the bar for how storytelling, characters and action sequences can produce movie going experiences that are intense to the point of being sweat inducing while being seated in an air conditioned movie theater. While Affleck is not to that level (yet), in many ways, "Argo" is a lesson in suspense and very smart control of tension and release. During this particular era in 21st century cinema, we have continuously been subjected to films where excitement is typically depicted through how loudly one can blast through the movie theater sound system and the amount of visual pyrotechnics a filmmaker can assault an audience with. By contrast, the power Affleck accomplishes with "Argo" is not attained through a pummeling hail of bullets and carnage but through nearly Hitchcock-ian levels of suspense brought out in the the most seemingly mundane moments, such as waiting for the right person to answer a telephone at the right time or through the act of waiting in line, just hoping that your true identity cannot be discovered when you are only inches away from freedom and survival. Scene after scene, as Iran falls into chaos and the urgency of the hostage situation and rescue mission threatens to spiral out of control, Ben Affleck shows a mastery of tone from one end of the film to the other, keeping everything rock steady. This particular quality is even found within all of the film's performances, especially Ben Affleck's. As Tony Mendez, what we are able to witness from Affleck is a lesson in stoicism, where those still waters definitely run deeply. While it may seem as if Affleck is not doing very much acting outwardly, just read the situation his character is inside of and how his ow internal conflict mirrors those of his colleagues and mostly, the six embassy staff members who are just counting the moments until potential escape or execution. Affleck understands that as Mendez, he also needs to elicit the same levels of control that the movie itself has aspired towards. Because if his character shows any signs of doubt, weakness or the most miniscule elements of unrest, those very signs could completely unravel the entire rescue mission as well as end the lives of himself and the ones he is desperately trying to save. As much as Tony Mendez has to appear to be in control, the movie does as well so it does not fall apart into a cinematic mess. I loved the scene (as shows in the photo which accompanies this review) where Mendez is grilling the embassy staff members on their new filmmaking aliases. Mendez stands in the middle of the room, addressing his charges in the same authoritative manner one could imagine a director addressing his stable of actors. And of course, we are indeed witnessing Ben Affleck the film director addressing and working with his stable of actors. A very cool, clever, self-reflexive moment in a film that explores the magic of the movies while also trying to create some magic of its own. Beyond the action and entertainment, I do believe that the politically minded Ben Affleck has a more subversive agenda at hand. As this film does indeed explore the time period which marked the end of President Jimmy Carter's presidency and the beginnings of a 12 year Republican reign, an era during which the political narrative has predominately argued that Carter was weak to the point of wimpish-ness. I would argue that perhaps Affleck is challenging audiences to re-thin that era, the legacy of President Jimmy carter and what it means to engage in the international community especially during a horrific crisis. It is of no secret or movie spoilers that by the end of the Iran hostage crisis, one year and two months after it began, all 444 hostages were released without any hostage causalities. I wonder if by revisiting this time through "Argo," we can have a glimpse back to an intense period where the President actually did not shoot first and ask questions later. Ben Affleck's "Argo" displays a time when sheer brain power and creative thinking were decidedly placed in front of bullets and bombs. Believe me, I do not believe that Affleck is trying to utilize "Argo" to make any naive points about the world and how it works, especially through seemingly impossible to navigate political crises. I do think, however, that what we know of our past compared with how our most intense international affairs have been handled for the past 12 years shows how much we have actually lost and what we could actually gain if we did try to think our way our of situations rather than confront them all guns and drone air strikes blazing. There will always be a time to fight but is that time every time? I was 11 years old when the hostages were freed. I remember that moment very clearly as a television had been wheeled into my 6th grade Social Studies class taught by the cranky, unreachable, handlebar mustached Mr. Larry Nespar. I remember another teacher entering the room as we all witnessed each hostage being freed and Nespar announced to his colleague "Free at last! Free at last!!" Now, most certainly, I was not the least bit politically aware back then as my mind was filled with girls, The Beatles and "Star Wars." But, I was aware that some historic was happening as the hostage crisis was part of the background noise of my life for those 14 months. "Argo" brought me back to that day so quickly and completely while also giving me a movie experience that was an entertaining and as exciting as it was thought provoking. Ben Affleck, how proud of you I am!! Any acclaim you will undoubtedly receive from this terrific motion picture is exceedingly well deserved. And for us in the audience, we are all exceedingly well rewarded when movies are as well made, thought and intentioned as "Argo." DEAR FRIEND: a review of "The Perks Of Being A Wallflower"
I am recalling a moment from high school that is simultaneously small yet unforgettable. The setting was my high school gymnasium. The event was an assembly of some sort, of which my memory, while hazy, is informing me that it had something to do with the bestowing of some student awards. What my memory is not hazy about is what I was doing and how I was feeling. It was sometime during the beginning months of my Senior year in 1986 when I was 17 years old. I was sitting in the bleachers with my ever present headphones strapped to my ears and my fingers were flipping the tuning dial through the static filled radio stations for a few moments. I stopped when I heard the sound of a lonely Hammond Organ, soulfully melodic bass guitar, spacious drums and an earnest voice soaring over it all. The song was "Don't Dream It's Over" by Crowded House. It was the first time I had heard the song and inexplicably, the music merged with the sights in front and around me, solidifying the moment forever into something that I remember the instant I hear the song to this very day. I guess for me and my spirit, the song, the gymnasium, the assembly and the time when I could begin to see the end of the high school tunnel all intertwined. It was a moment where I felt to be a central part of the high school experience while also feeling thankfully and miserably upon the fringes. There I was, engaging with a shared experience with people I had known for nearly ten years of my life and I felt as alone as if I had just begun at my school that very day. I was indeed blessed to have friends and tended to have a certain ease with attaining them but also, I was frightened and therefore resigned to the fact that there was nothing special about me and if there was, no one would ever be interested enough to try and find it. I had not been accepted to any colleges at that time yet and in fact, I still had SATs and ACTs to take (and re-take). I knew that I wanted nothing more than to be enrolled in the University Of Wisconsin-Madison but with the combination of my mediocre grades plus feeling like a failure for not living up to the rigid expectations of my uncompromising educator parents, my hopes for a bright future also seemed to be desperately far away. And of course, my love life, such as it was, remained sadly stagnant. Yes, I was as consumed with unrequited crushes as I had ever been, but at that time, I was soon to experience a swift yet painful break-up with the college girl I had surprisingly shared an intensely passionate kiss with the previous Spring. So, there I sat on those bleachers, with Crowded House unknowingly providing me with a life soundtrack moment, augmenting my serious loneliness, uncertainty about my own future and the deepest wishes for some sense of deliverance from my own ever mounting lack of self confidence. I was at once connected to everything and absolutely nothing. This afternoon, I experienced a motion picture that completely nailed that precise example of adolescent angst and heartbreak so tenderly and masterfully that the film as a whole is a work of sheer beauty. Author Stephen Chbosky makes for a stellar directorial debut with "The Perks Of Being A Wallflower," his adaptation of his own celebrated novel. Two years ago, I remarked emphatically that Director Will Gluck and Screenwriter Bert V. Royal's sensational high school satire "Easy A" was the very best teen film that I had seen in over 20 years as I felt it stood as tall as the finest of Writer/Producer/Director John Hughes' oeuvre. With "The Perks Of Being A Wallflower," that particular bar has been set even higher. In my recent tribute to Paul Feig and Judd Apatow's sublime television series "Freaks And Geeks," I gave my contempt for a youth obsessed industry that has habitually served its young audience so insipidly by treating teenagers as nothing but commodities and refusing to offer any sort of entertainment that can be artful. Stephen Chbosky has nearly single-handedly remedied this travesty through his film which, among others wonders, just performs the audacious act of treating teenagers with hearts, souls, humor, intelligence, and ultimately as three dimensional human beings worthy of having their story told with class and empathy. I can truly count on less than ten fingers the amount of teen related material I have held high esteem for since "The Golden Age Of Teen Films" concluded with Writer/Director Cameron Crowe's iconic "Say Anything..." back in 1989. You may count "The Perks Of Being A Wallflower" as one of those rare films. This is a must see! Set during the early 1990s in a Pittsburgh suburb, "The Perks Of Being A Wallflower" stars a most impressive Logan Lerman as Charlie, a quiet, introverted young man who is not only filled with dreams of becoming a writer, has intense anxiety over beginning his Freshman year of high school but is also moving forward after experiencing a personal tragedy (don't worry, dear readers...NO SPOILERS!!). As he struggles to navigate the high school hallways and an ever intimidating social structure, he is soon befriended by his kind hearted English teacher Mr. Anderson (a nicely sympathetic Paul Rudd), an act that certainly does nothing to ingratiate Charlie with his classmates. While attending a high school football game, Charlie finally strikes up the nerve to begin a conversation with Patrick (Ezra Miller), an openly gay and sharply sarcastic, smart mouthed Senior with whom he shares Shop class. Through Patrick, Charlie then meets Sam (Emma Watson), also a Senior, Patrick's step-sister and social outcast as she has been branded for being promiscuous in her past. Patrick and Sam take Charlie under their respective wings, introducing them to their collective, which Sam identifies as "The Island Of Misfit Toys." Among the group, we meet the sardonic punk Buddhist Mary Elizabeth (a wonderful Mae Whitman) and her sidekick Alice (Erin Wilhelmi), who houses dreams of one day entering film school. Feeling invigorated and elevated with his new acceptance into this close knit group of friends, Charlie receives a crash course in house parties, getting stoned from pot enhanced brownies, performing live on movie theater stages to "The Rocky Horror Picture Show," and most importantly, obtaining the camaraderie that arrives with the sharing of stories, hopes and fears with the ones who understand him best and accept him for who he is. Yet, as it goes with the nature of friendships, especially through adolescence, all is not sunshine and rainbows. As conflicts and misunderstandings emerge, Charlie's standing with the very people he has grown to love threatens to fracture. But, unbeknownst to Sam and Patrick, any possible dissolution between them will undoubtedly threaten to unravel Charlie's life. 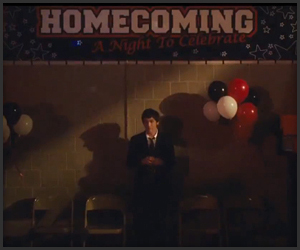 Stephen Chbosky's "The Perks Of Being A Wallflower" is one absolutely beautiful film. It utilizes a "year in the life" structure so effectively that you do indeed feel as if you have spent a transformative period in the lives of Charlie, Sam and Patrick so intimately, perceptively and so tenderly. While not without humor (and the film is often quite funny), "The Perks Of Being A Wallflower" is a moodier, darker and much more serious affair than films about teenagers usually are and that real world teenagers usually have presented to them. In addition to the standard adolescent rites of passage, Chbosky gives us a suburban world where Charlie and his friends are also faced with issues of child/parent and romantic relationship abuse, closet homosexuality, bullying, debilitating depression, potential suicide and crippling bouts of grief, guilt and mourning. Yet, Chbosky never allows his film to fall into histrionic melodrama by allowing the story to unfold and having the characters reveal themselves naturally. By doing so, Chbosky has created an emotionally fragile and melancholy world that makes "The Perks Of Being A Wallflower" a perfect film for a sad, autumnal afternoon or either a cold, rainy day. In fact, on several occasions, the film gave me memories of Writer/Director/Actor Zach Braff's "Garden State" (2004), another film that struck a similar sorrowful tone but was completely undone by its adherence to self congratulatory ironic hipness. Thankfully, Stephen Chbosky never falls into those sorts of storytelling traps as his obvious affection for his characters and this pivotal time of their lives is paramount and deserving of the utmost respect and sympathy. I thoroughly enjoyed all of the pop cultural touchstones set within this story so much so that I wondered if Chbosky was offering some sort of social commentary for how we relate to each other in the 21st century as compared to the early 90s before the technological sea change of the internet and cell phone culture. It was fascinating to me that Charlie, Sam, Patrick, their friends and lovers all communicate and are emotionally fulfilled through the art and artistry of the past. In addition to bonding over "The Rocky Horror Picture Show" (which I wondered was a nod to Director Alan Parker's brilliant "Fame" from 1980), the film's main trio adores the game changing alternative music from the likes of XTC and The Cocteau Twins. The music of The Smiths (a band tailor made for sensitive, lonely, introverted teens if there ever was one), particularly the suicide hymn "Asleep," plays a crucial role while David Bowie's classic "'Heroes'" also plays a major role within the story. Sam carries a passion for vinyl and record stores, Mary Elizabeth longs to experience the sophistication of foreign films and another character named Ponytail Derek (Nicholas Braun) creates specially designed artwork for his personal mixtapes, another source of handmade communication used between the characters. Even Charlie wears a "Jesus Christ Superstar" t-shirt when he is not otherwise wearing a suit designed to make him look like a Salinger-esque teen from long ago. His relationship with Mr. Anderson is fueled through the passing of literature for extra-curricular assignments, some of which are Anderson's own personal copies from his youth. Furthermore, the letters Charlie writes to an unknown recipient (always addressed as "Dear Friend") throughout the film are not composed on computer but through pencil and paper. And as a Christmas gift from his friends, he receives a typewriter. All of these objects and elements feel as if they are illustrating a certain disconnect the characters have towards the times in which they live. So they reach out for each other, creating their own tribe (a la "Freaks And Geeks") and they all attempt to seek solace as they are propelled into the future, whether they are ready to face it or not. The turbulent emotions that lurk underneath all of the characters gives "The Perks Of Being A Wallflower" its greatest urgency. Within Chbosky's universe, Charlie, Sam, Patrick and their friends are experiencing love and hurt not simply for the first time but almost as stop gaps to a potentially more emotionally fulfilling future. While these kids are just counting the days to the end of high school and the chance to begin their lives anew as the people they truly feel themselves to be, the pain they feel along the way as they live and just wait and wait is palpable. With regard to romance, misplaced affections are abound between the members of the group, one of which nearly fractures it for good. Through these moments, Chbosky also shows just how precarious the nature of teenage friendships can be and how within the large and brutal social circle and cliques there are smaller social circles and cliques that are equally brutal. Even within "The Island Of Misfit Toys," these kids can include or discard at a moment's notice without regard for how the suddenness of their love or rejection can effect someone else, especially Charlie who desires their friendship more than any of them realize. Like Author Jay Asher's excellent and deeply haunting young adult novel Thirteen Reasons Why, Chbosky wisely presents the issue that you just never, ever fully know exactly what and how much baggage another person is carrying internally. In "The Perks Of Being A Wallflower," almost every character is housing some secret or seemingly bottomless pain and while Chbosky perfectly captures the exhilaration Charlie feels with being accepted, the baggage and burdens he feels mounts heaviest. I cannot express enough how beautifully Logan Lerman navigates this incredibly tricky role of Charlie, our hero and narrator. He is indeed a wallflower, someone so quiet, insular and seemingly insignificant that he is barely noticed by anyone else. Yet he houses a horrific trauma, making his need for friends nothing less than a means for survival. The bitter-sweetness found in the relationships between Charlie and his new friends is truly voluminous. There is a burning ache in the fact that Charlie is a Freshman while all of his new friends are Seniors. Just as he arrives and begins to find some footing, everyone he loves is about to depart, potentially leaving him uprooted and adrift all over again. In regards to Sam, with whom he falls in love, this provides an especially persistent lump in the throat that gives "The Perks Of Being A Wallflower" the solid status of containing another cinematic love story this year that feels authentic. From beginning to end, Logan Lerman delivers a richly textured and nuanced performance that properly never calls attention to itself yet nearly upends you with the fullness of its power, especially as we learn so much, much more about Charlie's troubled interior life. As Patrick, Ezra Miller is indeed a young actor to keep your eyes completely open for. Like Charlie, the character of Patrick also carries deeply significant baggage which he buries publicly through his shield of abrasive humor, purposeful flamboyance and endlessly defiant wit. Within his circle of friends, Patrick is the de facto leader of "The Island Of Misfit Toys," and also works as protector and social/emotional guide for both Sam and Charlie. Yet also like Charlie, we see that all of this bravado is a front to keep the cracks in his veneer from showing as well as to keep himself from sliding into his own oblivion. Through the character of Patrick, Stephen Chbosky has presented the harsh adolescent truth that flies against every well meaning adult who has ever expressed to a struggling teenager that in just four years, this too shall pass and you will never have to see these people ever again. Patrick is the painful embodiment of one who wants to believe that aforementioned sentiment but through him, we all see the extremely long road it takes to arrive there. It is a journey that definitely unfolds day by day, hour by hour, and minute by minute and Ezra Miller's performance works as nothing less than a survival guide for current and future teenagers to cling to. And of course, there's Emma Watson who shines so brightly in her first film role since completing her 8 film arc as the brilliant, boldly courageous and devastatingly loyal Hermione Granger from the "Harry Potter" films. With her performance as Sam, it was truly a delight to see how luminous of a young actress she has grown into being. Aside from absolutely nailing her American accent, Watson strikes a fine balance of one who has long accepted her status as a social outcast yet keeps finding herself making the same social mistakes that sadly placed her into this position in the first place. Sam's long journey is one of discovering a newfound sense of self-worth, self-respect and realizing that one does not have to settle for less or even degrade oneself in order to find and have the romance and love that has been so wistfully longed for. The chemistry between Emma Watson, Ezra Miller and Logan Lerman is as strong and as hand-in-glove as the superlative casting in Hughes' best works as well as the ensembles from Writer/Director George Lucas' "American Graffiti" (1973), Director Amy Heckerling and Writer Cameron Crowe's "Fast Times At Ridgemont High" (1982), and Writer/Director Richard Linklater's "Dazed And Confused" (1993). These are three actors and three characters that you find yourself falling in love with for the nearly two hour duration of "The Perks Of being A Wallflower" and as with some of the very best movies, you feel the loss once the cinematic fairy dust has evaporated, leaving you seated in your movie theater seat. They are a triumvirate for the ages. Stephen Chbosky's "The Perks Of Being A Wallflower" is a wonderful film filled with characters that are intelligent, passionate, compassionate, difficult, flawed, romantic, urgent and brave and completely devoid of any vacuousness. The fact that the characters in question happen to be teenagers is truly remarkable and entirely deserving of your embrace. With the Fall Movie Season underway, there are, and will undoubtedly be, many films with much higher profiles arriving to capture your attention. I know you will wait in line for those films just as I will. But for now, I urge you to please seek this film out. For current teenagers, at long last, here is a film that loves and respects you and is made just for you. For those of us--like myself--whose adolescence is long behind them yet still remember and hold the full experience so dear to their hearts, here is a film that is so recognizably true to that precarious time of life. And for all of us, no matter what our age happens to be, "The Perks Of Being A Wallflower" is one of the loveliest films of 2012. When I first saw this film during its original release at the age of 14, I can honestly say that I just didn't get it at all. Yes, I understood the basic storyline of the angry, restless Rusty James and his angry, restless adolescence but once the film was all said and done, I just did not understand a whit about the actual point of the overall piece itself. Part of the joy of sitting in the dark and enveloping yourself with the movies is being engaged with the act of finding yourself lost within a story, where you somehow find either traces or full representations of yourself inside of the characters being reflected back at you. But, there are those times where the magic of the movies is contained in the act of being able to live vicariously through lives that are completely different than your own, and perhaps lives you would never envision for yourself in the real world. As I have have said many times before and I am certain I will say many times again in the future, movies, at their very best, exist as luxuriously as dreams. In my real life, I happen to be a man who has never actually had that many male friends as I tend to find much more in common and comfort in the company of women. But, in the movies, I have had this unexplainable fascination with certain rites of passage as they relate to groups of men, be it war films, crime dramas, boarding school excursions, bad boy comedies or even stories set within the world of gang culture. While my entire sense of being, which is more than a little cautious and savvy enough to be far, far away from dangerous situations, enlisting myself inside of the violent world of gang life was never to be an issue for me growing up in Chicago. But I did harbor a certain, and albeit vehemently trepidacious fascination with this specialized culture of brothers in arms. So, within the space of one week back in March of 1983, I saw Director Rick Rosenthal's intensely brutal (and filmed in Chicago) juvenile prison drama "Bad Boys," a film that alerted me instantly that Sean Penn was the finest actor of his generation. The other film I saw was "The Outsiders," Director Francis Ford Coppola's adaptation of the classic S.E. Hinton novel. By the time "Rumble Fish," Coppola's second Hinton adaptation, which was filmed back-to-back with "The Outsiders," was released that fall, I was more than ready to take that plunge into male driven, teenage fueled honor among thieves once again but when I emerged from the experience, I was more than a little confused. The cinematic language that Coppola spoke with throughout "Rumble Fish" was presented in so foreign of a fashion, I felt as if I had been viewing a foreign film! Whatever was commercial and accessible about "The Outsiders" was nowhere to be seen or felt within "Rumble Fish." The overall ambiguity and flat out strangeness of the experience kept me at arms length, even though it did intrigue me and it did afford a couple more frustrating viewings during my High School years. And furthermore, I could not for the life of me figure out the symbolism behind any images of fish being presented in color while the rest of the film remained in starkly photographed black and white. Now, over 25 years later, after a chance reunion on cable television, I have seen "Rumble Fish" through my adult and much more cinematically informed eyes. The emotions this film returned to me, plus the new ones that have emerged, compelled me to write this latest edition of "Savage Cinema Revisits," which I hope will compel you to seek this completely unique film experience out for yourselves. Where "The Outsiders" was a crowd pleaser, "Rumble Fish"exists as an audacious, impressionistic art film, the very kind of risky film experiment and experience that only someone on the level of Francis Ford Coppola could devise. This is an urgent, bracing, dreamlike film that is unlike anything else and even after almost 30 years since its release, it is still five minutes ahead of everything else. The dangerously pretty and ferociously charismatic Matt Dillon stars as the aforementioned angry, restless Rusty James, an Oklahoma teen who undergoes a pivotal odyssey over the course of "Rumble Fish." The child of an alcoholic Father (Dennis Hopper) and a long absent Mother, Rusty James shares an alternately tender and tumultuous relationship with Catholic school girlfriend Patty (Diane Lane) and hungrily prowls through his existence, hoping to touch the past street and gang life glories previously attained by his legendary and long departed older brother, The Motorcycle Boy (an enigmatic Mickey Rourke). When one gang fight too many leaves Rusty James seriously injured, The Motorcycle Boy returns to his rescue, an act that propels Rusty James towards his life's turning point. I have to say that watching "Rumble Fish" again after all of this time, my feelings initially remained as they were back in 1983. I was mesmerized but just confused. Stylistically, Francis Ford Coppola has created a stunningly captivating canvas made up of spare parts from the French New Wave cinema of Jean-Luc Goddard and the German Expressionism of Fritz Lang. While the film is indeed shot in stark black and white cinematography like those aforementioned film genres, "Rumble Fish" is somehow as visually lush as a 1950's melodrama. On another yet similar technical level in regards to the cinema of the 1950s, the spoken dialogue cadences throughout "Rumble Fish," to my ear, echoed the likes of Director Nicholas Ray's "Rebel Without A Cause" (1955) or Director Douglas Sirk's "Written On The Wind" (1956). Although I am remarking about the film styles and genres of the era prior to Coppola's film, I should note that "Rumble Fish" is not designed as a period piece as it does appear to take place within the (then) present day, especially when you have the very modern, up to the minute innovative soundtrack from Composer/Percussionist Stewart Copeland (more on that unique element a bit later). And yet, the film is not plot driven, parts are decidedly non-linear and one section is entirely...oh, shall we say...out of body. It is through those particular dreamlike qualities that make the film appear as if the entire thing may be taking place inside of Rusty James' mind. Despite all of this cinematic razzle dazzle, I was still finding myself unable to get a real handle upon everything that I was watching and therefore, I was again finding it difficult to care very much about Rusty James and his dilemmas. But then, there was one short moment set inside of Benny's Billiards, a teen hangout operated by Benny (played by Tom Waits). In a striking shot, a clock sits at the closest forefront of the frame while Benny speaks to an unknown listener, maybe the audience or perhaps no one at all. He mutters and stammers about the nature of time and how slowly it moves when you are a child but once you grow up, you begin to wonder how many summers you may happen to have remaining. "35 summers left," Benny muses solemnly. "35 summers..."
And with that, the puzzle pieces of "Rumble Fish" finally began to click into place. Possibly what Francis Ford Coppola has done with S.E. Hinton's original story was to take the genre of teen angst and gang violence and use them as catalysts to create and explore something more philosophical. Quite possibly, "Rumble Fish" is a treatise and existential musing on the elusiveness, elasticity and overall illusion of time itself. And for Rusty James, time is an especially mischievous demon as he cannot ever outrun it or keep up with it and he seems to be always out of step with it. He longs for a gang culture that has passed him by as he is nostalgic for periods he was too young to experience himself. 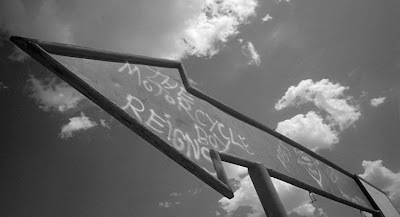 Coppola's imagery of fast moving clouds, looming and hulking shadows and the signposts of clocks are prevalent throughout "Rumble Fish" as visual reminders of the world spinning endlessly, without empathy or regard for whatever Rusty James may be waiting for. This aspect of the relentless nature of time I felt was captured astonishingly well by Stewart Copeland's music score, which is indeed one of my favorite film scores of all time. Copeland is truly and dearly one of my musical heroes as his performances as the drummer/percussionist of The Police awed me and continues to do so to this day. With his film score for "Rumble Fish," Copeland, for my perceptions (especially as a drummer myself), re-wrote the rules for what a drummer could actually be. Working in terrific collaboration with Coppola, Stewart Copeland created mystical, feverish and entirely rhythmic extensions of Rusty James' soul. Just listen to the the backgrounds of the scenes as you watch this film and hear the continuous loops of percolating mini-cymbals, electronic beats, menacing marimba patterns, drum kits merged with the likes of typewriters, heavy machinery, ticking clocks and car horns, all of which underscore Rusty James' tumultuous life. Whether he is in violent motion during a gang fight, laying injured in repose, feeling tired and falling asleep on Patty's couch after a healthy make-out session, or internally lashing out at the world as he waits and waits for a sense of understanding or even spiritual deliverance, time marches onwards, refusing to wait for him to figure out and decide upon being the person he wishes to become. Stewart Copeland's score is a masterful achievement of sound, musicality and commitment to enhancing the process of creating a character and his cinematic journey. Rusty James' urgent inner search for the person he thinks he should be and how that compares and conflicts with the person he actually is was a theme that just was not obvious to me when I first saw the film due to its cinematic extravagances. In addition to that theme plus the nature of time, I also now think that we are witnessing Rusty James' struggles with his overall romantic view of his world (however misguided) vs. the reality of his world. He carries a romantic view of the violent gang life even when his sidekicks Smokey (Nicholas Cage), B.J. (the late Christopher Penn) and the studious Steve (Vincent Spano) all reject it. Rusty James is bested in every fight sequence we see him involved with, suggesting that he is just not tough enough for the world he claims to crave. The Motorcycle Boy's return is especially crucial for Rusty James' story because we can see that the enigmatic Motorcycle Boy has undertaken the exact same journey for himself. The identity of The Motorcycle Boy remains one of the largest mysteries contained in Coppola's "Rumble Fish." We know very little about him and we never even learn his real name. We don't know why he abandoned his life in Oklahoma or why he decided to find a potentially brighter future in California. We can infer many things but we never really know why Officer Patterson (William Smith) seeks supreme vengeance against The Motorcycle Boy. We never really know what The Motorcycle Boy's life was like in California, although I have been housing a suspicion that he just may be homosexual, due to a sultry magazine photograph that was taken of him. While we do not know much about The Motorcycle Boy, that lack of concrete knowledge does not diminish his overall purpose in regards to Rusty James. While his violent past has left him colorblind, deaf in one ear and an appearance that makes him look much older than his 21 years, The Motorcycle Boy is mostly consumed with massive regrets, conflicting emotions about his legendary status and an equally urgent desire to save the life of his younger brother, who idolizes him for all of the wrong reasons. If he is to indeed save Rusty James' life, The Motorcycle Boy needs to shatter his brother's romantic notions in the way he most likely destroyed similar notions within himself, making "Rumble Fish" a riveting tale about brotherly love and responsibility to each other. Dear readers, please take a moment and ponder about the films you have seen throughout your lives that maybe did not make much of an impression upon you initially but have grown in stature over the years. As often the case with music, I do believe that movies sometimes choose the viewer, reaching out for you at just the right time and place in your lives, where full acceptance and understanding is at the ready. This chance reunion with Francis Ford Coppola's "Rumble Fish," while completely unexpected, was enormously rewarding and I am sincerely hoping that this edition of "Savage Cinema Revisits" will encourage you to check this film out for yourselves, either again or for the very first time. I guarantee that you haven't seen anything quite like it. As I look back upon the postings of the previous month, I am struck by the large amount of solemnity contained in the reviews and tributes. I suppose the arrival of Fall made it a more contemplative month. For October, while some of those qualities may re-appear, I am hoping to experience something a hair more visceral. I think I am ready to be cinematically rocked again. During this month, there are two films in particular that I am waiting for with high anticipation and equally high curiosity. 1. "Argo," from Director Ben Affleck is my top priority by far. His career re-invention has been a supreme joy to witness as he has shown a filmmaking skill that I never knew was possible for him. The first trailer I saw had me riveted and I am hoping the entire film will do the same and then some. 2. "Cloud Atlas," the new film from The Wachowskis and their first collaboration with Director Tom Tykwer who gave us the extraordinary "Run Lola Run" (1998). Like so many of you, I have seen the six minute trailer and was indeed blown away by the sights. This movie feels as if it could be either a masterpiece or a disaster and I would nto miss this for anythng at all. 3. "The Perks Of Being A Wallflower" has not arrived in my city yet and that is also one that remains high on my personal "must see" list. 4. "2 Days In New York" from Actress/Writer/Director Julie Delpy, and also starring Chris Rock, has indeed piqued my interest. 5. I also have a new edition of "Savage Cinema Revisits" in the hopper and just about ready to release to the world. ...And I'll see you when the house lights go down.